I always laugh at some peoples superstitions, but then I also have a few of my own that people laugh at me for! 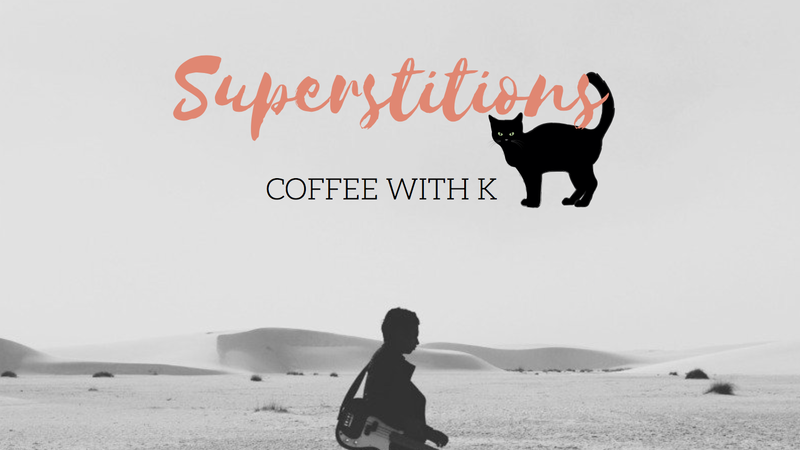 I don’t know where they come from, but there are some things that leave me uneasy – and since I should be doing some spooky October themed blog posts, I thought this one would be fun! Three drains – I don’t know if there is another word or phrase for it, but I was always told that if you walk over three drains in the street that are joined in a row – then it’s bad luck. So I always avoid them and walk around them! And if I see anyone else walking across one (whom I’m with), I have to give them a punch as their bad luck so they don’t get it… Weird, I know. Walking under a ladder – Apart from the fact I have the fear it will fall / slip on me, I also think it’s bad luck to do so. It just feels so icky and wrong! Opening an Umbrella inside – I’ve heard that if you do it, like, sideways its okay? Or more acceptable haha! Friday the 13th – Ok, so this one for me is real! I swear I get the worse luck on Friday the 13th! Something really weird happens, so I tend to stay indoors and away from the world haha! Touch-wood – I think this can also be called knocking on wood. But if anyone says something like “I’ve never broken a bone in my body before”, I’m always like “TOUCH WOOD” as if you’re tempting fate and you’ll jinx what you’ve said and the next day you’ll break a leg. Putting new shoes on a table – I don’t know why this is back luck or wrong, but I never do it haha! For the groom to see the bride on the big day – I think its something about it creating bad luck on the marriage or that the bride will get cold feet and not turn up? I also just wouldn’t want them to see me before I walked down the aisle so I can make a big entrance haha! Saying bless you after a sneeze – So I usually do say “bless me” or “bless you” after someone sneezes, but just out of manners rather than thinking something worse will happen. Find a penny, pick it up – I like the idea, but don’t think it’s true haha! Spilling salt – I actually didn’t know this was a thing until recently where I spilt salt and someone said to throw it over your shoulder or something?? And then I think I threw it over the wrong shoulder apparently… I don’t understand this one haha!